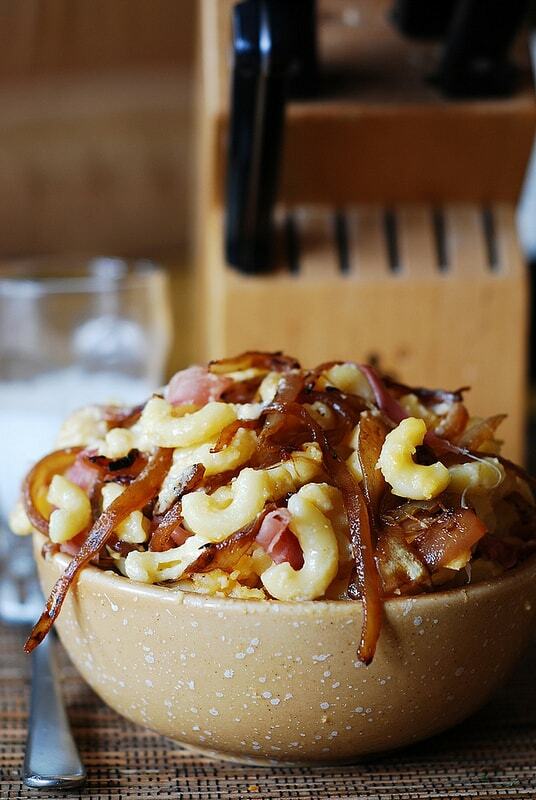 Macaroni and cheese with bacon and caramelized onions. The addition of caramelized onions makes this an adult version of a childhood favorite mac and cheese recipe. Mac and cheese brings up nostalgic memories in a lot of people, as it certainly was a favorite food for a lot of us growing up. I’ve always wondered, however, whether adults remain as passionate about mac and cheese as when they were children, and for me the answer to that is YES! 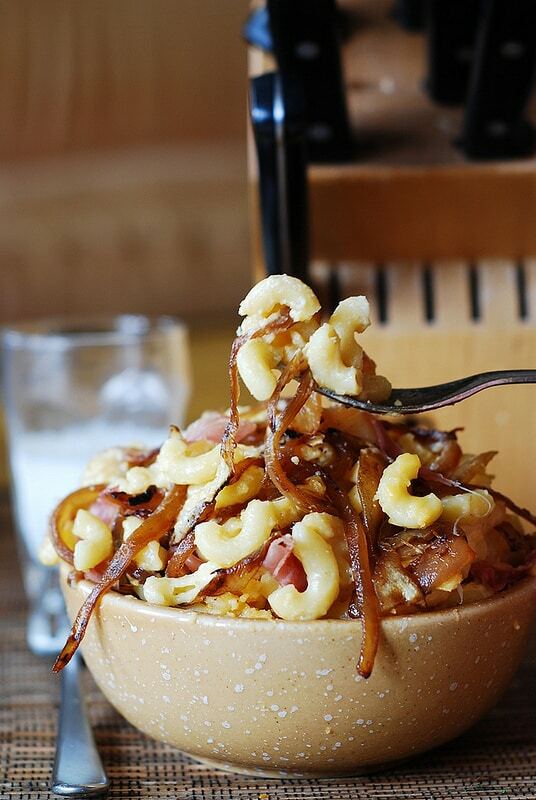 Except, these days I like to enhance my mac and cheese with funky additions, such as bacon and caramelized onions. Oh my yum! Don’t even get me started on how good bacon is in this dish. To go even further and make it even fancier, I often use prosciutto or pancetta in place of bacon – and that elevates this mac and cheese to another completely yummy level! Also, I like to simplify things, just like when I was a kid, and this recipe is especially simple since I don’t use Bechamel sauce (and I did make a classic homemade mac and cheese recipe using Bechamel sauce once), I don’t make roux, and I also don’t use custard-based cheese sauce. I just simply mix milk, heavy cream, white Cheddar and Gruyere cheese (in just the right proportions to achieve the desired creaminess) plus spices – to make a very creamy and cheesy mac and cheese with bacon and caramelized onions! I guess based on the cooking method I used I could call this mac and cheese – Fettuccine Alfredo, too! Adding caramelized onions certainly makes this more of an adult mac and cheese, and what a delicious addition it is! Just make sure to caramelize onions for 30 minutes to make sure they brown thoroughly, without burning. In the end, you should have onions that are soft and sweet from all the caramelization process. This mac and cheese can be served as is, or as a side dish to the steak, which is how I like it! 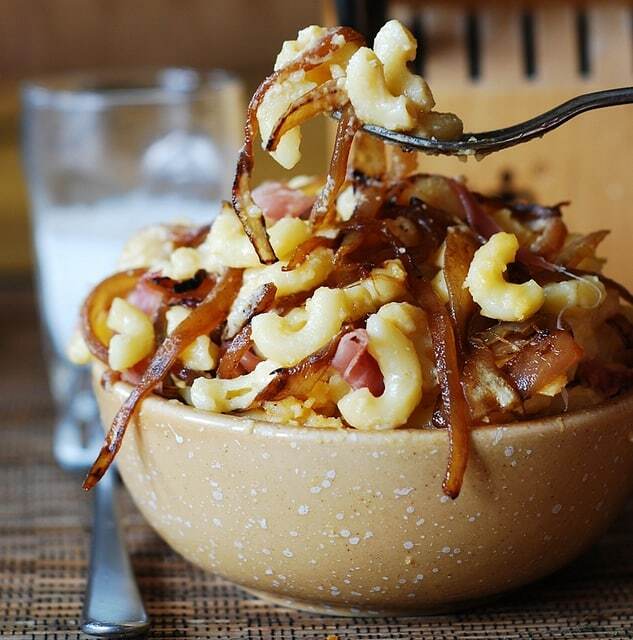 Macaroni and cheese recipe with bacon and caramelized onions. Adding caramelized onions certainly makes this more of an adult mac and cheese. Heat 1 tablespoon olive oil on high heat in a large skillet, when oil is heated, add sliced onions and cook on high heat for about 10 minutes, constantly stirring with spatula. The onions should start to brown, but without burning (a couple of onions may be burnt here and there, but overall they should not be charred). Reduce heat to medium and continue cooking onions for 10 more minutes, continuing to stir, as onions brown even more without burning. At this point add just a pinch of salt over onions. Continue cooking for 10 more minutes on medium or low heat, stirring occasionally to make sure onions don’t stick to the bottom of the pan or burn. Total you should have cooked onions for 30 minutes. Remove from heat and sprinkle onions with a small amount of balsamic vinegar to deglaze the pan. Using spatula, mix the onions, scraping the bottom of the pan and coating onions with a pinch of balsamic vinegar you just added. While you’re caramelizing the onions, cook bacon: I usually bake it in the oven at 350 F until it just turns crispy. Drain the bacon on paper towels and chop into small pieces. Cook elbow macaroni according to package instructions. Rinse the macaroni under cold running water, drain. Set aside. In a large saucepan, add heavy cream, milk, sharp white cheddar cheese, Gruyere cheese and 1/4 teaspoon salt on medium heat, stir and mix, until cheeses start to blend. Add black pepper, Cayenne pepper and paprika to your taste, or omit them if you don’t want them. Add elbow macaroni to the creamy sauce, stir to coat on low heat for about 5-10 minutes until cheeses melt completely and coat the macaroni. 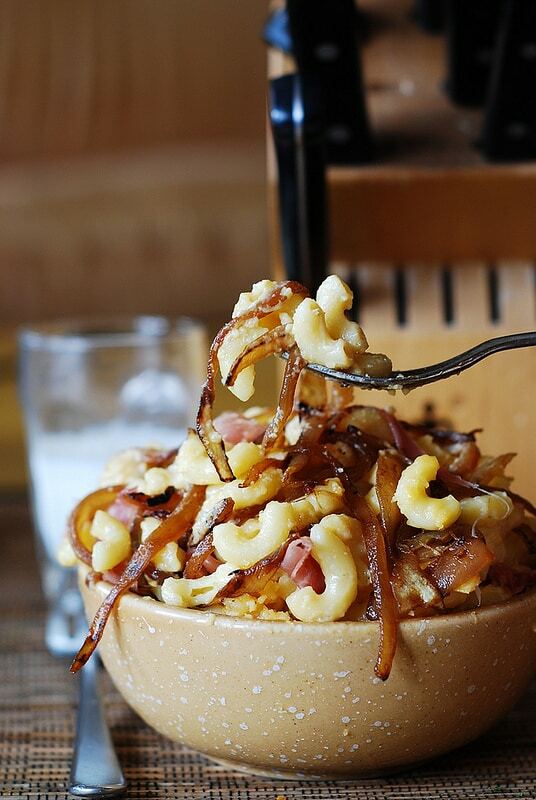 Add caramelized onions and chopped bacon to the creamy macaroni. Serve as is, or with more cheese (finely shredded) sprinkled on top. My recipe was included in The Kitchn’s Delicious Links! This dish goes in the comfort food category. The carmalized onions are delicious (just be sure to cook as instructed for proper carmalization). I used prosciutto, as I had an abundance of it in the frigde, but believe the bacon would be fabulous as well. Thank you, Wendy! This is definitely the comfort food! Prosciutto is great here, as well as bacon! Hi! My husband and I LOVE your mac and cheese. Question though – how do you mix in the carmalized onions where they don’t get cheese coated all over them? what would happen if i baked this in the oven?